nothing exciting going on today, went to the mall with Mama Pawlish in the morning and now i'm just home watching tv and blogging! i need to start getting stuff together for the big move... but i'm still kind of in denial that we are leaving in two months. *sigh* wish we weren't going! today's polish is Ciate Cha Cha Cha... at least, i'm almost positive that's the name! because of the price label, the name ripped off... but i'm pretty certain that this one is Cha Cha Cha :) i bought it at Marshall's, i think it was split up from it's set. 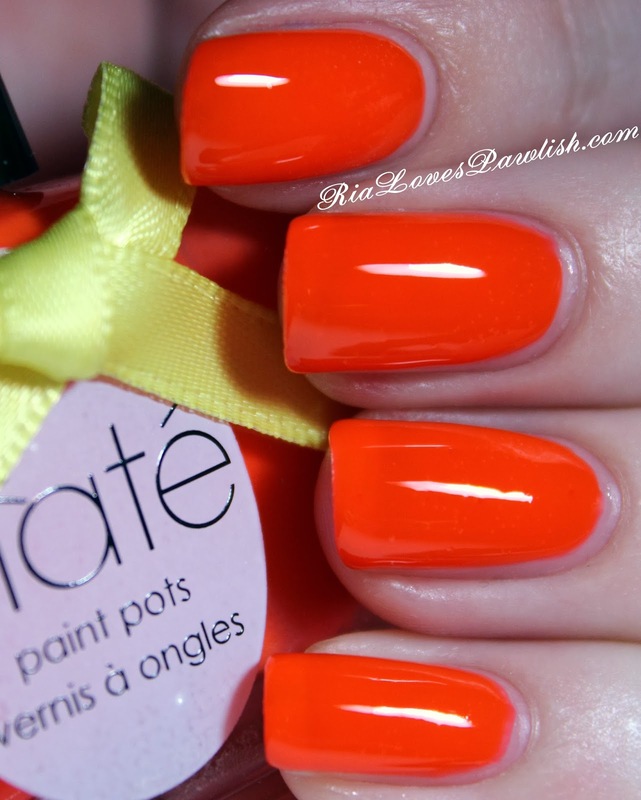 Cha Cha Cha usually comes in the Ciaté® Corrupted Neon Manicure Club Tropicana kit. it's a bright, red-toned orange creme. it dries down to a rubbery finish, so i recommend topcoat. i was satisfied with the coverage at two coats, but there is still a bit of visible nail line! two coats Cha Cha Cha, one coat Sally Hansen Insta-Dri Top Coat. Ulta Friends & Family 20% Coupon!